"Combining the right colors and patterns with the right form motivates me as a designer and glassblower." Nanda Soderberg is inspired by 1950's modern Italian design that is bold, clean, and simple. He strives to combine this aesthetic with current trends in the design world. Soderberg loves the process of blowing glass. Stemming from his research and practice of historical glass working methods, he is constantly discovering new ways to create pattern and color through the use of murrine (long rods of glass that are cut in cross sections). 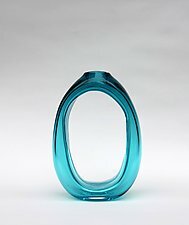 The artist has been enthralled with glass as a material since first witnessing live glass blowing at the University of Hawaii at Manoa and in 1998, Nanda received his BFA and moved to Seattle. After eight years of production glass blowing, he relocated to Richmond, Virginia to attend graduate school. In 2005, Soderberg received his MFA from Virginia Commonwealth University. 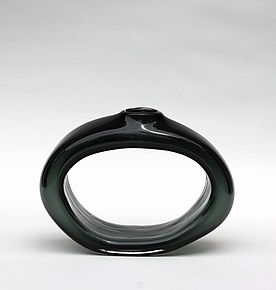 He has also studied with many notable glass workers including Lino Tagliapietra and Pino Sognoretto.